ENIUGH actively promotes research in world, global, comparative and transnational history by publishing scholarly articles, book reviews, announcements of conferences and workshops as well as shorter interventions in the debate on methods and theoretical approaches. The main periodicals of the network are COMPARATIV. A Journal for Global History and Comparative Studies and Connections. A Journal for Historians and Area Specialists. COMPARATIV (founded in 1991) serves as an intellectual platform for the formation of an interdisciplinary group of junior and senior scholars who explore world and global history. It focuses on past and present globalizations. Their manifold social, cultural, political and economic aspects are addressed from the perspectives of both change over time and variation over space (their different processes of territorialization and spatiality: regional, national, European and worldwide). Comparative perspectives are taken up, as are studies on cross-cultural entanglements, exchanges and transfer. Comparativ publishes articles in German, English and French. The electronic complementary of Comparativ is Connections is a peer-reviewed e-journal in the field of area, transnational, transregional, world and global histories, edited on behalf of ENIUGH by Matthias Middell (Global and European Studies Institute and Centre for Area Studies at the University of Leipzig) and Katja Naumann (Leibniz Institute for the History and Culture of Eastern Europe). Connections is a part of the H-Soz-u-Kult, Clio-Online and H-Net network, which acts as an information and communication platform. Connections continues the work of geschichte.transnational, which has been published as a review forum since 2004. Today, Connections, with its 11.000 subscribers broadens the perspective by also addressing global and transregional as well as transnational entanglements that increasingly characterize our present world. The journal encourages contributors to transcend a traditional understanding of space as a container within which societal processes occur and to instead investigate the dynamics resulting from such entanglements. Connections, however, does not solely concentrate on border-crossing flows but also looks at attempts to reorganize control over and regulation of such flows by all kinds of politics, among them prominently the politics of respacing. In this capacity, the journal organizes interdisciplinary cooperation between historians, social scientists and specialists in the various area studies as well as in the newly emerging field of transregional studies. Global History and International Studies focuses on analyses integrating historical and social sciences approaches towards processes, phenomena and actors transcending national and continental borders. In particular it assembles findings from studies on critical junctures and portals of globalization as well as on global moments. 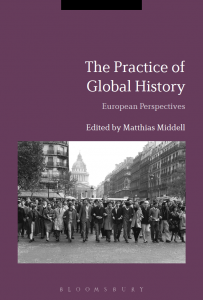 “Global History and International Studies” is edited by Ulf Engel, Frank Hadler and Matthias Middell. Click here for the publications of the series. Beginning with the ENIUGH congress 2014 in Paris, a close collaboration between ENIUGH and Bloomsbury Publishers was agreed in order to make available main results of the congresses as well as monographs in the field of world and global history to a wider audience. The first volume on specific European traditions and approaches in the writing of world and global history was launched in 2018. As a network of historians and their colleagues from neighbouring disciplines, ENIUGH continues a long tradition of studies on the past’s transnational and global dimensions. To foster and to refresh this tradition ENIUGH awards the Walter Markov Prize – endowed with € 1,500 – for an outstanding master’s or PhD thesis. The prize honours an outstanding thesis that contributes to the research fields of Walter Markov: the comparative exploration of revolutions; social movements and decolonialization processes in Africa, Asia, and Latin America; historiographical traditions in various national contexts; and academic internationalisation in the course of the 20th century. The successful applicant will receive € 1,000 as support for the publication of his/her master’s or doctoral thesis. Walter Markov (1909–1993) was a historian whose life and thinking was influenced by the shattered German past. In trying to integrate his experiences of National Socialism, his decade-long imprisonment in a state penitentiary under the Third Reich, and the following Cold War, which he looked at from the Eastern side, his works sought to integrate the intellectual potentials of the historical thinking of Karl Marx and impulses from French social history around the Annales school. Markov’s way of addressing history can be best described as a “history from below”. Examining revolutions and revolutionary moments in history, he became one of the most important German historians working on the French Revolution. In continuing the Leipzig tradition in world and global history, initiated by Karl Lamprecht and the Institute for Cultural and Universal History, Markov became the director of this institute in 1949 and tried to bring all area studies at his university under one roof for comparative studies. Pursuing international cooperation with scholars on the other side of the iron curtain – especially with scholars from Latin America, Africa (where he was the first German guest professor), and Asia – he hoped to stand against any withdrawal of his university from border-crossing dialogue and mutual learning. Applicants should submit their manuscripts, a summarizing abstract of 250 words and a brief CV electronically and as one PDF file to: headquarters@eniugh.org. In the sector of academic teaching ENIUGH offers administrative support for bi- and multilateral cooperation in the field of M.A.- and PhD-programmes, by advising individuals and groups on how to obtain EU funding and helping them organise joint summer schools. So far in Europe efforts have been concentrated rather on research than on the educational programs, so an implementation of world and global history in the classroom need attention in the future, because it is vital to the success and visibility of the field. ENIUGH is currently among others involved in the Erasmus Mundus Master program “Global Studies“, which is based upon strong cooperation of universities from Austria, Australia, Cameroon, China, France, Germany, India, Poland, South Africa, the UK, and the US. In this way ENIUGH is also part of the Global Studies Consortium, a network of more than 30 graduate programmes from all around the world, collaborating in teaching and research. ENIUGH cooperates with a wide range of European and non-European institutions and encourages institutional as well as individual membership in order to strengthen Global History at all levels of academic activity from research to teaching, from public debate to the support for globalising the teaching of history at the level of secondary education. ENIUGH supports the World History section of the biannual European Social Science and History Conference organised under the responsibility of the International Institute of Social History (Amsterdam) and invites papers for 6–10 panels at each of these conferences. The next congress is to be held in Leiden in 2020.